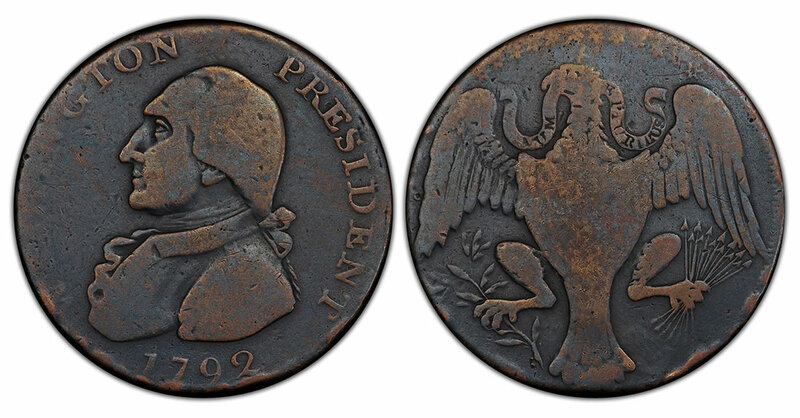 A drastically but deceptively altered 1792 Washington Eagle "cent" submitted to Professional Coin Grading Service (www.PCGS.com) underscores the alarming skills of some so-called "coin doctors" and why it is essential to have rare coins expertly and independently examined. The Washington Eagle “cent” as it appeared prior to its recent submission to PCGS. Photo credit: Professional Coin Grading Service www.PCGS.com. Detective work by PCGS experts proved the recently submitted early American coin had been deceivingly repaired since it was offered in auctions between 1966 to 2013 to remove a hole, alter re-engraving and change the coin’s color to give it a radically new appearance. PCGS Co-Founder David Hall described it as "one of the most deceptive and clever alterations I’ve ever seen. The quality of the work was so good, it’s scary!" The elusive 1792 Washington Eagle cent with a 13 star-reverse and lettered edge (Baker 21) was from the Ted Craige collection and sold at auction by Stack’s Bowers first in January 2013 where it brought $3,055 and then again in August 2013 when it realized $9,988. "There was considerable excitement at PCGS when we received what appeared to be a new, previously unknown example of this significant Colonial rarity," said PCGS President Don Willis. "While the planchet was rather dark, the coin appeared to be undamaged and certainly worthy of a grade. It was only after some serious detective work that things began to look a bit strange. Some telltale marks began to match up, and despite looking superficially nothing like the holed piece, PCGS was able to conclude that the recently received coin was, indeed, none other than the Ted Craige specimen," Willis revealed. The coin traces its pedigree back to Mayflower’s Stern’s Sale in December 1966. "At its last public auctions, it was a pleasing light brown specimen with Fine sharpness but was unfortunately holed at 12 o’clock on the obverse. There had also been a crude attempt to re-engrave the stripes on the shield on the reverse. Only about half a dozen examples are presently known, with at least half of these damaged in some way," explained PCGS Content Editor Mike Sherman who wrote about the discovery of the deceptive alternations. "The quality of the alteration was nothing short of phenomenal. Not only had the surfaces been darkened to a very natural-appearing (though not particularly attractive) color, but also the re-engraving on the shield was gone and the hole had disappeared without a trace. 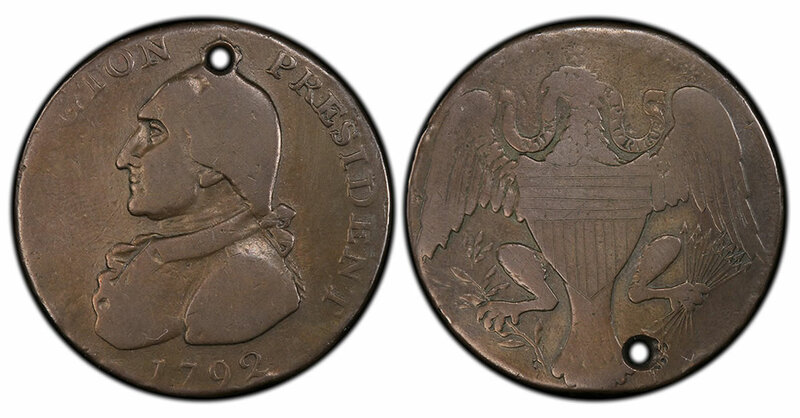 The Washington Eagle “cent” as it appeared when it was recently submitted to PCGS. Photo credit: Professional Coin Grading Service www.PCGS.com. Missing detail from where the hole had once been was flawlessly reconstructed. Even the stars at the top of the reverse seemed to once again be visible," said Sherman. "While PCGS is justifiably pleased with the sleuthing effort from the grading room, this coin serves as a powerful reminder that one cannot ever let down their guard and that some truly talented ‘doctors’ are out there and capable of some very deceptive work. Obviously, expert authentication of rarities is a must for all serious coin buyers," stated Willis. Would’ve be easier to compare if the photos were closer to each other. These so called coin doc’s, do have a certain skill, or talent, that could be used to make an honest living, *i wonder what they do for a living.